Aragorn II (TA 2931-FO 120), son of Arathorn II, was one of the Dúnedain, and the heir of Isildur. Following the death of his father, when Aragorn was only two years of age, his mother Gilraen took him to Rivendell, where he was raised in secret by Lord Elrond. He was known as Estel (‘Hope’) until he had reached twenty years of age, at which point his lineage was revealed to him and he was given the heirlooms of his line – the shards of Elendil’s sword Narsil (later reforged into Andúril) and the Ring of Barahir. He withheld from Aragorn the Sceptre of Annúminas until he had earned the right to possess it. It was also at this time that he first beheld Elrond’s daughter, Arwen: from that moment on, he loved her. Though they plighted theirtroth upon Cerin Amroth, Elrond would not allow his daughter to marry any Man less than the King of Arnor and Gondor. Aragorn went off into the Wild for nearly seventy years to partake in the fight against Mordor. In disguise, he served both Thengel of Rohan and Echelion of Gondor. In the latter realm, he was known as Thorongil, due to the star of the Rangers that wore. As a Ranger of the North, he also clad himself in simple green and brown. He met Gandalf in 2956, and they became close friends; for thirteen years, he pursued Gollum at Gandalf’s request, until finally apprehending him in 3017. The following year, he met the Hobbit Frodo Baggins. After leading Frodo and his companions to Rivendell, he became one of the Nine Companions, taking over leadership of the Fellowship after Gandalf fell fighting the Balrog in Khazad-dûm. After the Fellowship had broken, he traveled to Rohan with Legolas and Gimli. He helped lead the defense at the Battle of the Hornburg, becoming fast friends with Théoden’s nephew, Éomer. Accompanied again by Legolas and Gimli, he took the Paths of the Dead, commanding the Dead to fulfill the Oath they had sworn to Isildur (and broken) long before. With their help, the Corsairs at Pelargir were defeated and the tide was turned at the Battle of the Pelennor Fields. 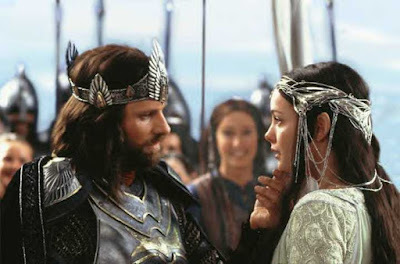 After the War of the Ring, he became known as Elessar Telcontar, the first King of the Reunited Kingdom and Lord of the Western Lands (TA 3019-FO 120). 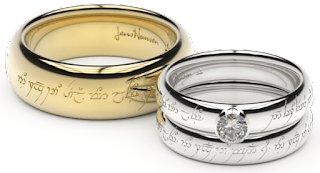 He married Elrond’s daughter, Arwen Undómiel, who bore him one son, Eldarion, and a number of daughters. As one of the Dúnedain, Aragorn had been blessed with a lifespan thrice that of any normal Man. At the age of 210, he laid himself to rest in the House of Kings. Aragorn was called Elessar and Elfstone by Galadriel and the people of Gondor. To the people of Bree, he was known as Strider. He was also called Isildur’s Heir, the Renewer, Longshanks, and Wing-foot. I was just gonna say: How come King Aragorn and Britta are getting married?"